Learn more about the demonstration gardens located at ISU Research Farms. The Master Gardener Volunteer Manual helps to answer the question of what Master Gardener can do for volunteer service and how to remain active. Watch this two minute video to learn more about the new Iowa Master Gardener website. Learn how to attract pollinators and grow herbs from Nathan Brockman and Susan Appleget Hurst. Part of the Growing Season webinar series from the Iowa Master Gardener program, thanks to Iowa State University Extension & Outreach. Learn how to minimize irrigation in the garden and how to create water features. Dr. Denny Schrock talks about low-water use gardens and Jamie Beyer showcases water features. From the Iowa Master Gardener program, thanks to Iowa State University Extension and Outreach. Learn about theme garden design from Lisa Orgler. Then find out how to build a trough garden from Gary Whittenbaugh. Part of the 2015 Growing Season Webinar Series from the Iowa Master Gardener Program. Thanks to Iowa State University Extension & Outreach. Starting in June, participating ISU Extension and Outreach county offices will show the 3-part webcast series. Jessie Lowry, Blank Park Zoo, will share pollinator best practices. Aaron Steil, Reiman Gardens, will share the in-depth answers to frequently asked garden questions. Grant Thompson, ISU Department of Horticulture, will show how to create plant communities that mimic nature. Contact your ISU Extension and Outreach county office to learn more. 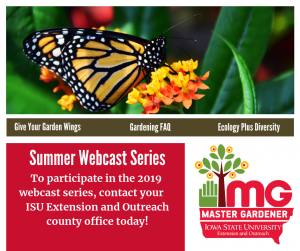 Master Gardener volunteers can gain continuing education hours by viewing webcasts at participating ISU Extension and Outreach county offices. Read the press release. Dan Fillius will provide organic weed-free vegetable growing tips to reduce pests. Elin Filbey will share examples of how to attract new people to the garden. Ed Lyon will explore a dozen ways to create container gardens. The Growing Season webcast series includes presentations to enhance MG volunteer projects. Topics are: Invasive Insect Update, Tree Care, Attracting Local Bees, Growing Organic Vegetables, Compost 101, and Growing Roses in Iowa. Read the press release here. Watch the videos on YouTube here.